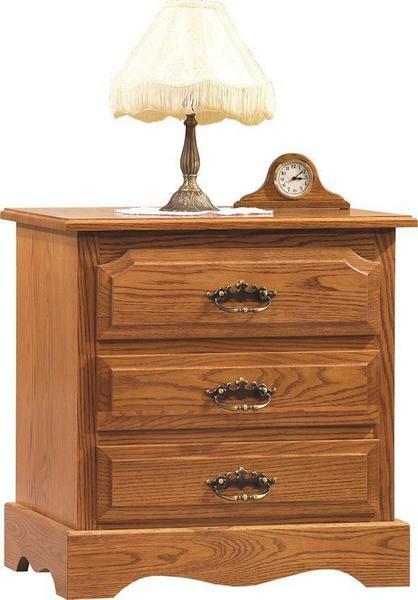 From the flowing details of the base and feet, to the beveled top and drawer fronts, this elegant nightstand offers an antique style that will bring a beautiful, early American feel into your bedroom suite. Placed next to your bed, the large top is critical for housing your beside essentials, while the three dovetailed drawers below coast on full-extension slides, ensuring you have storage space for everything you need for the evening ahead. With eight different hardwoods available - you can choose from the most traditional woods, Quarter Sawn White Oak or Cherry, to the more modern Rustic Cherry and Rustic Hickory, and everything in between to customize the perfect piece to incorporate into your bedroom suite. Finish it up with your choice of premium stain, topped with a conversion varnish and hardware for a beautiful look and heirloom quality finish that is sure to be a family favorite for generations to come. 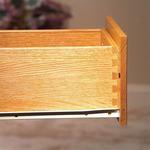 While each piece is crafted in a standard size, we understand that no every bedroom offers standard space. 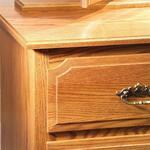 If this piece has the design you're looking for, but you need it altered, no problem! Give us a call and let us help you build the perfect nightstand with a free custom quote, stain samples and answers to all of your questions. Toll-Free (866) 272-6773.